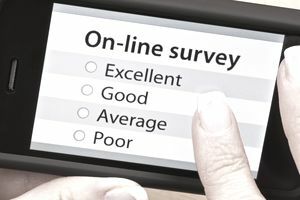 Online surveys usually are more an inefficient money-maker than out-and-out scams (though they can be total scams). The pitch is that companies will pay you to participate in consumer research. But the amount paid per survey versus the time spent finding and completing surveys means you could make a lot less than minimum wage or perhaps nothing at all. That's right, you could end up spending time on surveys and never earn anything. It's important to check how much you must earn before a company will pay out your earnings. Often there is a minimum payout. A threshold of $50 may not seem too high at first when the website promises hundreds of dollars, but in reality, you may give up before you earn $50 because you realize it will take hours upon hours to get to that minimum payment amount. So in addition to overstating potential earnings and time required, online surveys have an even darker side. These companies make money by relentlessly pitching a range of products to their survey takers, who may feel the expected income justifies the expenditure. Also, you must give out your phone, email and other information, which they will sell and so you will be bombarded with spam. You will also most likely get a pitch for much more dangerous work-at-home scams, so if you are going to do online surveys know the telltale signs of a work-at-home scam. Online survey companies may offer incentives for you to sign up others to take surveys. Especially, if those incentives seem out of proportion with the pay and work required it could be that these are pyramid schemes so be very wary of any survey company that pays you based on recruiting others into online survey work. In the end, one thing that is guaranteed with online surveys is that you will get emails and phone calls based on the information that you are required to give out so be sure to read how to avoid spam first. Requires payment. Always a potential sign of a scam. Doesn't appear to make financial sense for the company. Think about why would a company pay so much for something so easy to do. Require you to use your own money or recruit others.